The way the Jawaharlal Nehru National Solar Mission is making progress, it is expected that solar energy will soon be as cheap as energy from conventional sources. At least, that is what emerged from the second batch of bidding under the National Solar Mission held on December 2 for 350 MW capacity. The lowest bid was for Rs7.49 per unit, which is 50 per cent lower than the benchmark tariff of Rs15.39/unit fixed by the Central Electricity Regulatory Commission (CERC). Bidding became, as expected by some, very fierce and the lowest bid of Rs7.49 per unit was made by Solairedirect India, a subsidiary of a French company. Green Infra Solar made the last highest successful bid at Rs9.44 per unit. B Bhargava, director with the Ministry for New and Renewable Energy (MNRE), says this is a big step towards grid-parity (parity with tariff for energy supplied through the national grid) for solar energy in India. The average price for the winning bids came to Rs8.78/KWh. The lowering of bid prices could be because the price of solar modules, which make up 50-65 per cent of the cost of a solar power project, have fallen continuously since 2008. Gaurav Sood of Solairedirect India says his company will opt for “crystalline technology from a domestic producer and the plant will be set up in Pokhran area in Rajasthan”. Other successful bidders in batch II include Azure Power India, which took home 35 MW of capacity at a discounted tariff of Rs8.21 per unit. When asked whether the bid price is'nt too low, Inderpreet Wadhwa of Azure Power India responded: “No, not at all, this is where prices are in Europe.” Azure Power uses US Manufactured thin-film solar panels and is financed by the US Exim Bank and the International Finance Corporation (IFC). Down To Earth (DTE) has earlier reported on the import of solar equipment under the national solar mission. There are, however, steep fines if a company does not finish its project in the allotted 13 months from the date of signing the contract. A substantial bank guarantee has to be given, which is taken away gradually over a period of three months if a project is delayed. Depending on project cost, the penalty, by way of loss of bank guarantee, would make up 24 to 43 per cent of the cost for bidders giving the highest discounts while for projects giving discounts in the lower range, the penalty would amount to 17 to 30 per cent. For the first batch of PV projects, the deadline is January 9, 2012. So, stakeholders will soon get to know whether the fines are high enough to coax the developers into meeting project deadlines. DTE had earlier reported that some projects may be delayed. Alex Spectrum Radiation, which had not started working on its project even by mid-October (with a deadline of January 9, 2012), took part in the bidding but was disqualified as it failed to furnish some original documents along with the bid. Many of the larger players in solar were completely absent—Tata BP Solar put in no bid and Lanco Solar made an unsuccessful bid under the name Omega Solar Projects. manufacturer of diesel generator sets. 1) Symphony Vyapaar and Lexicon Vanjiya - SPVs of Vikram Solar Pvt Ltd, manufacturer and EPC player in the solar industry. 2) NVR Infrastructure - SPV of Atha Group, invloved in iron ore mining and production. 3) Enfield Infrastructure - SPV of Sonthalia Group, currently planning a venture into manufacturing of PV modules. If you think any of the above information is incorrect please let me know via email. The statistics provided above are not 100% accurate. I'v cross-checked it from a list released by NTPC VVNL. 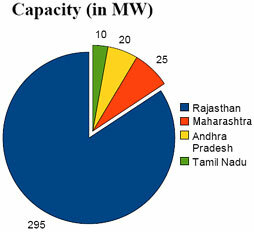 For ex: Green Infra has bagged 20MW and 5MW in Rajasthan as per NTPC and not two project of 20MW each. There are some more. what is the execution status of the projects allotted in November 2010 under National Solar Mission (NSM)? Thank you very much for adding this. Information in the table what was I could find in the public domain. This is very useful and apprciated. Thank you for your input. We will check this again. The list was made just after the bidding and before NVVN released the final list. Are there more issues than the one you brought up? I would be happy to fix the issues. We have not gotten the exact list as NVVN is vary of giving it out. For the third period of delays (not commissioned by March 9th) MNRE is stating that CCCL, Rithwik, KPCL and one other project has had their full bank guarantee encashed. Thank you for the information, do you also happen to know who Kimya Power Systems is? They have a big solar power plant in Karnataka but I have no idea where this company is based.